It’s no longer just a millennial thing. At issue is openness to – and consumption of – animal fats. In its third iteration, a new consumer survey from Coast Packing Company and Ipsos Research indicates that Americans 35 and up are more receptive to including animal fats in their diet than they were a year, or two years, ago — and are acting accordingly. While the embrace of animal fats by millennials – those ages 18 to 34 – emerged as the dominant story in the previous two studies, receptivity to animal fats isn’t limited to millennials. 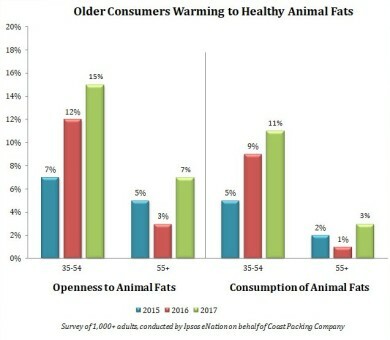 Both age segments of older respondents showed an increase in openness to animal fats, with 35-54 year-olds moving from 12 percent to 15 percent, and respondents ages 55+ more than doubling their receptivity to animal fats over the past year, from 3 percent to 7 percent. Among millennials, 16 percent say they’re open to animal fats. By gender, men are markedly more receptive than women — 15 percent to 10 percent. A similar relative shift in consumption is occurring among the two older age segments: 35-54 year-olds moved up from 9 percent to 11 percent, and respondents age 55+, from 1 percent to 3 percent, marking an increase in animal fat consumption. Among millennials, consumption increased by 13 percent. Mirroring the data on attitudes, consumption by men increased 12 percent vs. 6 percent for women. As in the original baseline study – conducted in November 2015 – this new survey of 1,000 adults examined how attitudes about animal fats in the American diet have changed in recent years, and how consumption patterns may be changing as well. Respondents were asked whether they were more or less open to animal fats, and whether those views extended to actual behavior. Coast Packing is the number one supplier of animal fat shortenings in the Western United States.